The driveway leading up to your home or business in Sacramento, CA, may need to be more secure to prevent numerous unwanted intruders from entering your property. Linmoore Fencing of Sacramento specializes in the fabrication, welding, and design of high-quality iron driveway gates, security gates, keypad entry systems, wireless remote access entry systems, and security driveway gates in all styles and designs, including; sliding gates, lift gates, double gates, single swing gates and even double swing gates in Sacramento. We will construct, fabricate, powder coat, and install an iron driveway gate that is 100% to your liking. 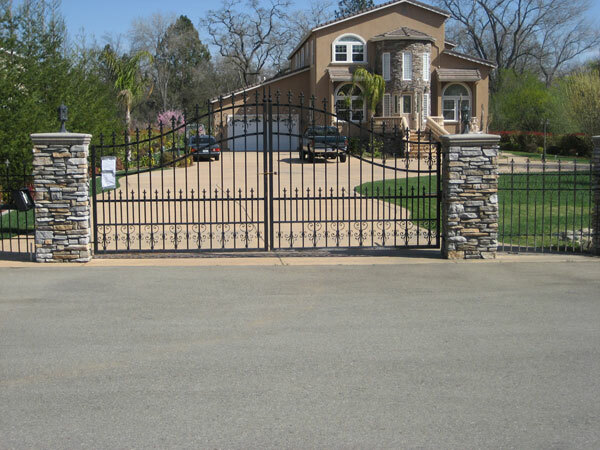 Iron driveway gates combined with an iron fence may also be a great way to keep children, family, and pets inside the premises of your property or commercial location in Sacramento. Decorative and ornamental wrought iron driveway gates are commonly thought to be installed in only luxury homes and commercial locations in the Sacramento area, however; that does not have to be the case for you. Our contractors can design and fabricate a beautiful, ornamental works of art for your residential home in Sacramento at a very affordable cost. If you're looking to increase the curb appeal and overall decore of your home or business in Sacramentoll Iron Contractors today to find out more information.